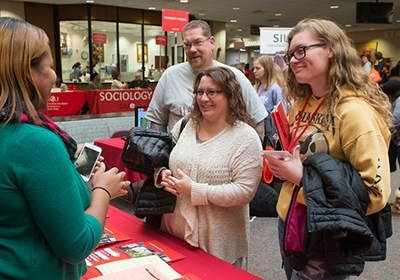 The Southern Illinois University Edwardsville Office of Admissions invites prospective students to register for Preview SIUE and experience the University’s array of academic programming, student life opportunities and available support services. High school and transfer students are encouraged to take advantage of one of two remaining sessions of the University’s most popular visit program being held Saturday, Nov. 3 and Monday, Nov. 12. Registration is available at siue.edu/undergraduate/visit/preview. On Saturday, Nov. 3, students interested in laboratory sciences, math, or fine and performing arts will have an opportunity to participate in hands-on activities in SIUE’s state-of-the-art labs, tour its theater and visit the newly remodeled art and design facilities. On Monday, Nov. 12, the College of Arts and Sciences will highlight programs in the humanities and social sciences. Students interested in majors such as English, history, philosophy, foreign languages and more will have an opportunity to sit in on a class and interact with faculty and current students. 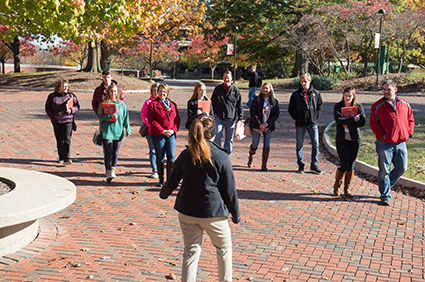 Also on Nov. 12, in support of Veteran’s Day, prospective students can choose to take a campus tour guided by a veteran student ambassador. They will also have the opportunity to speak with a Veteran Service representative regarding benefits or for details on passing benefits on to a child. For more information on Preview SIUE and other campus visit programs, explore siue.edu/visit. Photos: Visitors meet with an SIUE representative during Preview SIUE. Prospective students and visitors enjoy a tour of SIUE's campus.